The reason I am running is that I helped out Diarmuid Ó Curraoin last year with his campaign and found talking to students I saw the issues students were facing and I felt that I was in a position to help them. I wouldn’t be a traditional Students’ Union head, I’d very much just be a normal student, and I just really am passionate about making students’ lives that bit easier. What is the one thing that you are hoping to achieve as President over everything else? Without a shadow of doubt, if I could reform the approach the university, staff, students, the entireuniversity as a whole takes to mental health. At the moment if you have a physical ailment you can go to the health unit and you’ll be seen very quickly, within half an hour, it’s a brilliant service for physical ailments. But the services for if you have an issue with mental health aren’t nearly as good, and it isn’t approach on the same level. So I would absolutely love to reform that entire system, not only expand the services that you’d be seen a lot more quickly, and expand on the attitude about mental health, that it will be a common thing for students to say, “Yes, I’m struggling with this but I’m going to counselling for one day a week and will be fine in a few weeks,” and the same as saying “I’ve a broken ankle”. It’s even to break the stigma – although stigma is the wrong word because there isn’t the same stigma around it as there was even three or four years ago. But just to push it forward and really reform how everyone thinks about it, to offer Assist training to everyone and to push that the suicide prevention training so that it’d be a common thing you have, almost like saying I got my pool lifeguard cert when I was 15 or 16, a common thing like I got my Order of Malta first aid training in TY. Saying “I got my Assist training” wouldn’t be a very common thing to say, even though it is a normal thing. Can you briefly outline the other key points in your manifesto? One of things that came up a lot last year when I was engaging with students, I found out what was annoying them the most. That is just the most important, what annoys students. One thing that came back an awful lot was that there is not an awful lot of places on campus for you to sit around without having to pay for something. In the Bialann, you have to pay for something, the college bar you have to pay for something, Friars, Zinc, everywhere you have to pay for something. There is not enough places that you can just talk, or go on your laptop or sit on your phone, or just chill out for ten or 15 minutes. At the moment, the lobby in the library is where most people hang out and that really isn’t good enough. I’d like to expand with chill-out rooms and the like. The next point then is that we absolutely have to look at the repeat fee for exams. An awful lot of colleges like Maynooth, if you fail one exam you pay €80 and that increases then, you pay by exam. Whereas in NUI Galway it is a flat fee. If I was lucky enough to get elected, if students choose me as their president, in my first meeting with University President I would raise that with them, saying, “look, listen, if this is the system you want to approach, if it is not something that can be changed, we need to offer more support to students to pay for this, a flat fee for 295 is just not good enough and not fair. If one person has one bad exam, they fail an exam by one or two percent, or if someone fails seven or eight exams, they pay the same and to me that just makes no sense, that is just baffling to me. Capping is standard across universities, but the flat fee is absolutely not standard. When it was announced it was said this was in line with other universities, and that is just untrue. I know the Students’ Union this year managed to expand the library opening hours at the weekends around exam times. I don’t have the data to hand exactly what the uptake was on that, but I would love to expand the opening hours during the week, nothing too drastic just another hour or two in the evening. Come 10:30pm or 11pm exam week, the Reading Room is wedged you can’t get a seat and there is a demand for it. So even just an hour or two in the evening would make an enormous difference to students. What is the main issue on campus for students in your opinion? This one is a tricky one, because it is subjective to each and every student, each and every student would have a different issue given your course, where you’re coming from, or if you’re living at home or accommodation. So what I’d love to do with that is to engage with students to figure out exactly what the issue is for different groups of students, it is not enough that the issue would just address the needs of the extremely academic, or those who like to go out a lot, or living in accommodation. It sometimes can be a little bit like that, so I’d like to have a more inclusive kind of union where every different type of student, even those who wouldn’t traditionally engage with the union at all, wouldn’t know where the Bailey Allen is, I’d love to get talking to those students too to find out what kind of issues they’re facing. Normally, people say not enough parking spaces, not enough plugs in the library, these are things that come up. But what really drives me is talking to students who aren’t shouting about their issues, who wouldn’t engage with canvassers, they wouldn’t snap the SU or go on our Instagram. I’d really love to get students who don’t come in or are only here to get their degree, I’d love, love, love to talk to those students and hear what their issues are. How do you intend on spending the budget given to you for services to students? One of the main things I’d love to do is expand Mental Health, and at the moment there is a massive budget for the Health Unit and that should remain as it is, it is a brilliant service. Having said that, I’d love to expand the budget for the Mental Health service. At the moment there is only a small place on Distillery Road and get more services for those kinds of students, for students who would need it. I know the SU this year did enormous work getting two extra microwaves in Smokey’s and one up in the Engineering building and theyre getting a second one. But they haven’t got one in Friars yet, so we would keep lobbying Friars, and if it did require that a purpose microwave unit had to be built I would like that to be done, because it is not fair on those who spend all their time in the Cairnes building. How will you encourage people to interact with the Students’ Union? 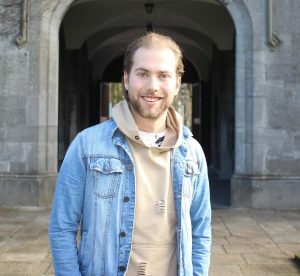 The first thing is that Lorcán, Andrew and Megan did incredible work with the Snapchat and Instagram and that has been 100pc getting more students to engage. Even last week because of the snow, every single student found out about that, and it wasn’t from e-mail or Facebook, but it was from Lorcán updating the Snapchat and Instagram videos. Great work has been done on that and I’d like to keep expanding on that, pushing on that. Having said that, one initiative I want to bring in is that every Monday or Wednesday, given time, that the three sabbatical officers whoever they may be would have open office hours, and bring their office down to Smokey’s between 2-4pm and have a massive sign up saying “What annoys you most?” And have students have come up and say the one thing that annoys them and then that can be addressed. Even among my own classmates and friends, I hear them say a gentle “Oh that’s annoying” or “that’s frustrating” but they’re not sure what the avenue is. So if every Wednesday 2-4pm the officers are their to listen to your complaints or about what is making you angry, I think that is a way to find out what on-the-ground, normal students are thinking or feeling. Once you know what those issues are you can engage on that and sort out those students, get their e-mail and follow up with them. A big thing I’d like students to know is I am not a traditional SU head at all. I’m very much a genuine, normal student and I’m just trying to make students’ lives easier, that is what I am passionate about, I wouldn’t have been big into SU politics, didn’t have a clue what the SU was when I was in First Year, and I am just a normal student and I’m passionate about making students’ lives easier.